Earlier this year, Costco reported that it had sold nearly 400,000 vehicles of all makes and models at its stores across the country with the purpose of making its members happy. Today, Sam’s Club launched a similar endeavor that will put keys in the hands of the warehouse store’s faithful following. 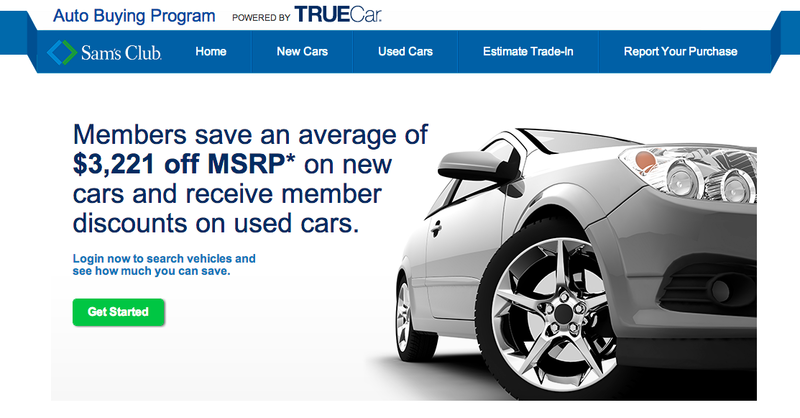 Sam’s Club announced today that it had partnered with TrueCar for its new Auto Buying Program that aims to give members discounts and exclusive savings of up to $3,000. Under the program, Sam’s Club members will have access to more than 10,000 TrueCar Certified Dealers nationwide – more than three times the nearest competitor in the warehouse club channel, the company claims. Like the Costco program, Sam’s Club’s version aims to differentiate from the typical car buying experience, avoiding the typical haggling and upselling one might expect. “By empowering members with critical pricing information prior to purchase, the Sam’s Club Auto Buying Program improves the entire car-buying experience,” the company says. To access the program, members visit SamsClub.com/auto, enter their location and desired car type. They are then given information on what others in their market paid for the car they want, and can then browse pricing information from local dealers. Once members are satisfied with their choice, they print their Guaranteed Savings Certificate or bring it on their mobile device to the selected TrueCar Certified Dealer to finalize the purchase. It’s unclear if Sam’s Club will be making money off of their car brokering foray. That’s certainly not the case for Costco: much like its unprofitable practice of selling rotisserie chickens to keep members loyal, the retailer doesn’t actually make money on the car sales it helps broker. Instead, Costco only offers the discounted vehicles to attract and keep members.